﻿The book A Self-Study Guide for the Pre-Examination of the EQE - Part I: The Legal Questions is a 294-page A4-size book. The preparation for the Pre-examination starts with understanding the basic concepts of European patent law, including the legal and formal aspects of the patent system as well as the substantive issues such as, in particular, novelty, inventive step and priority. In methodology courses preparing for the EQE, such as the ones given at Maastricht University, more and more candidates enroll who did not attend a basic course in European patent law, but familiarized themselves with the relevant issues. The author realized that simply studying the EPC and the PCT by working through the Articles and Rules sequentially and/or by reading the Guidelines for Examination in the EPO or the PCT Applicant's Guide is not the best manner to learn how the patent system works. ​In order to enhance the manner of studying, the current book provides a structured approach on what to study and also gives guidance on when to study. 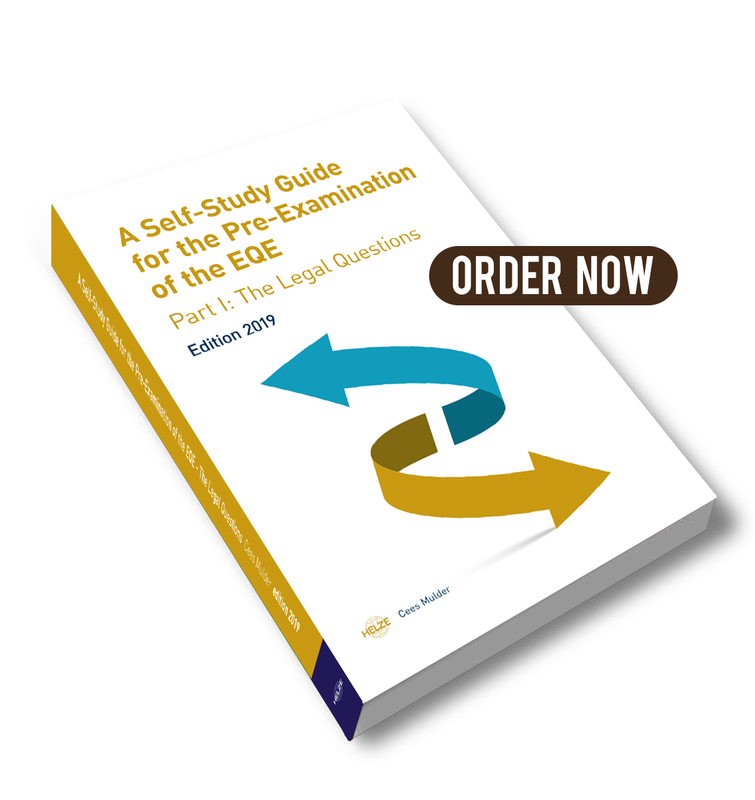 In particular, the book focuses on the preparation for the legal questions of the Pre-Exam, although a number of substantive issues is dealt with, which are indispensable for answering the questions relating to the claim analysis part of the Pre-Exam. In the book, twelve main topics have been selected around which a Study Guide has been built. For each topic, the important issues are grouped in tables allowing a structured study of the topic. The content of the tables is sufficiently detailed to allow a successful self-study of the issues. In addition, a methodology for answering the legal questions of the Pre-Exam is presented. The book has been kept compact by only referring to the legal texts and other study material. Comprehensive Keyword Indexes (separate ones for the EPC and the PCT) help the users to quickly find the relevant topic in the tables. In the 2019-edition new entries have been added and the keyword indexes have been expanded. In addition, comments of users have been incorporated. In the claim analysis part of the Pre-Exam, you have to show that you have sufficient knowledge in reading, interpreting and analyzing patent claims. The EQE Pre-Exam training is designed to teach you how to digest the text of the claim analysis part and how to apply theoretical concepts such as scope of protection, novelty, inventive step, clarity and allowability of amendments in a practical manner to the questions asked in the Pre-Exam. This 2-day course is given in November in Maastricht and is followed by an online learning trajectory till the Pre-Exam. The legal questions of the Pre-Exam requires you to quickly and correctly apply your legal knowledge to a legal situation presented in each of the 10 questions. This training course will teach you a practical methodology for answering multiple-choice legal questions. This 1-day course is given in November in Maastricht and is followed by an online learning trajectory till the Pre-Exam.